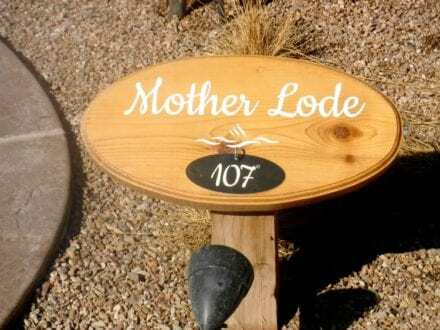 Home » Blog » Family Vacation Destinations » Western States Destinations » Relaxation & Rejuvenation at Iron Mountain Hot Springs! Dan and Grady relaxing, watching the river! Photo Credit: Susie Kellogg, Unstoppable TravelingMom. Relaxation & Rejuvenation at Iron Mountain Hot Springs! As a full-time traveling, homeschooling family, we are always on the lookout for activities that will be fun for the entire family. We want everyone to be engaged and to have fun and, if at all humanly possible, to learn something from the experience. As a result, we often find ourselves gravitating to water in any of its glorious forms, from beaches to rivers to snow and, yes, even Hot Springs! 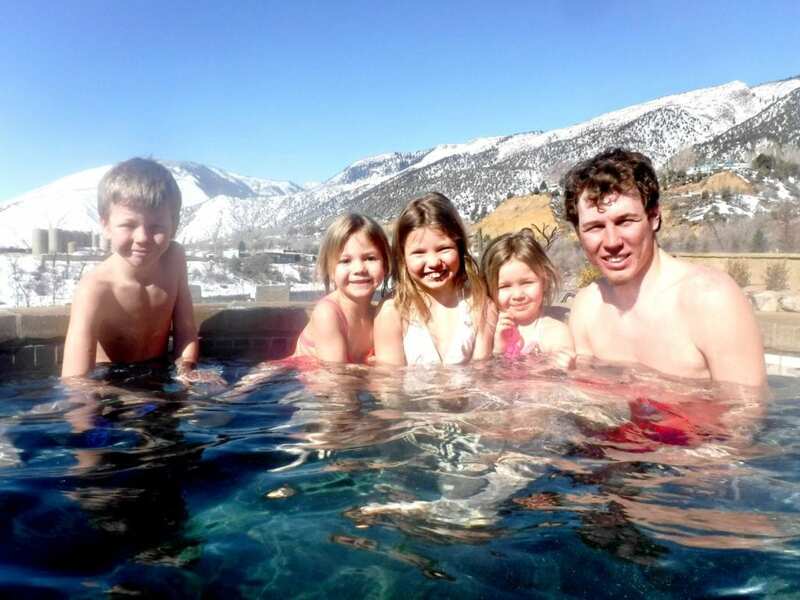 The kids in one of the 16 private geothermal pools! Photo Credit: Susie Kellogg, Unstoppable TravelingMom. And so it should come as no surprise to people when they hear we head to the Colorado mountains in the winter, That’s right, snowy, cold, beautiful and sunny Colorado!! Colorado with its rivers, its snow covered mountains and even those hot springs we tend to love. We can’t imagine wintering anywhere but in a winter wonderland like Western Colorado. You may not be aware, but Colorado is a hot springs mecca. They are everywhere! You can find them in the rivers, you can find them in the mountains, and like green eggs and ham, you will find that you like them everywhere. It’s no lie that hot springs are magical; they make you feel like a younger, healthier, more vibrant human being than you ever thought possible. They eliminate stress and frustration, and the warm waters have a healing affect that were recognized by native Indians and used for their benefits. 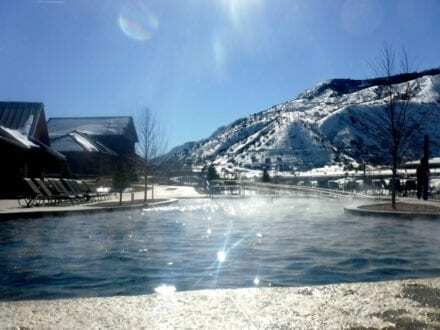 The newest hot springs pool to pop up on our radar is the luxurious spa-like Iron Mountain Hot Springs in Glenwood Springs, Colorado. Coming up on their one year Grand Opening anniversary, they are located on the site of the historic Iron Springs Spa circa 1896. I find that very fitting as Iron Mountain Hot Springs is as much a spa as I’ve ever been to. And I make a habit of frequenting spas … I must, for my sanity. After all, I am a mother of 12! Sitting and relaxing in any one of the 16 pools, complete with a “quiet zone” for peace and tranquility, is the ultimate pampering. You may sit and take in the beautiful surroundings, you may splash and play in the family pool, and you may even order anything from water to mixed drinks to be enjoyed whilst soaking. All this while overlooking the Colorado River, amidst towering snow covered mountains. It really doesn’t get any better than this. And Iron Mountain Hot Springs is equally enjoyable for adults as it is for kids. There is a large family pool heated to a perfect 92 degrees where kids can romp and play, with a whirlpool spa above, set at 102 degrees for parents to enjoy while supervising the kids. For our large family with a 19 year age span between kids, finding a family friendly activity that everyone can enjoy is rare and deserves to be recognized. At the Iron Mountain Hot Springs, kids of all ages can splash and play, older kids can relax with a book or even meditate or stretch in any one of the many pools. Good eats can be found in Cafe Sopris, the cafe beside the family pool, and parents can relax and enjoy the peace and tranquility offered at Iron Mountain Hot Springs. One of the 16 Hot Springs Pool, this one is the hottest! Photo Credit: Susie Kellogg, Unstoppable TravelingMom. It is an irrefutable fact that soaking in mineral hot springs brings about many miraculous healing benefits and have been an important part of stress relief and healing for thousands of years. In fact, the Native American Indians considered hot springs a sacred place and thus were great believers in the miraculous healing powers of the heat and mineral waters. Did you know that every major hot springs in the U.S. has some record of use by the Indians? Iron Mountain Hot Springs is no exception. Chalk this knowledge up to some homeschool research on the Ute Indians! Much speculation is made and it is widely accepted that the combination of the temperature of the water along with the mineral content has had proven benefits for people suffering from ailments such as arthritis, fibromyalgia, asthma, depression, stress, anxiety and many many more problems. In fact, soaking (or playing with the kids) in mineral hot springs is one of the oldest forms of medicine there is. 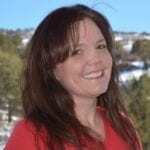 When we first visited Glenwood Springs, I became fascinated with the idea of homeopathy. In researching I discovered that in Europe and Asia this sort of therapy is called Balneotherapy and is actually taught in medical school … something the local doctors around the Iron Mountain Hot Springs could tell you a little about, for sure! Geothermal waters help the body by detoxing, reducing tension, increasing circulation, calming the mind and the body, relaxing muscles, stimulating the immune systems, nourishing the skin and even decreasing pain! And that, my friends, is why you will feel like a completely different person when you leave. You will also sleep more soundly than you have in years … you have my word on that. The southern view from the Iron Mountain Hot Springs. Photo Credit: Susie Kellogg, Unstoppable TravelingMom. I cannot imagine a place in the world, let alone the country, that has a setting more conducive to relaxation, rejuvenation and healing than the Iron Mountain Hot Springs. The pools all overlook the Colorado River as it passes through Glenwood Springs, Colorado, and the Rocky Mountains loom above with a protective, beautiful feel. The air is crisp and clean, the sun shines 360 days per year, and you are sitting in a geothermal hot springs pool, without a care in the world! The 16 private pools are surrounded by a quiet area that ensures your ability to relax and enjoy the mineral waters as your body rejuvenates and heals and calming music streams out of discreet speakers. The Iron Mountain Hot Springs offers an elevated experience the heals, calms and nourishes your mind, body and soul. Named after the majestic snow-capped mountain, Mount Sopris, that is visible from the Iron Mountain Hot Springs, the Sopris Cafe is an onsite cafe conveniently located right beside the family pool. Yes, it’s true. They serve … alcohol. I mean, the way I see it, Happy Hour is forever redefined. After work, or a wild day in the backcountry, instead of heading to a local bar, why not round up your friends for a real treat, a spa evening and a drink or two to further the relaxing effects of the geothermal springs. And while you are at it, why not fuel your body with a healthy salad or wrap?